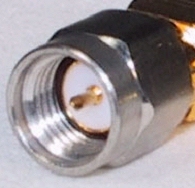 The SMA connector is the workhorse of the RF and microwave industries. The basic design uses a 4.2 millimeter diameter outer coax, filled with PTFE dielectric. About a zillion companies make SMA-style connectors. Their upper frequency limit is anywhere from 18 to 26 GHz, depending on the tolerances held during manufacturing. SMAs, like many other coax connector families, are sized to fit a 5/16 inch wrench. SMA connectors will mate with 3.5mm and 2.92mm connectors. However, you should always inspect and gage an SMA connector that you will be mixing with the more expensive connectors to be sure that you don't damage them. Below are pictures of SMA male and female connectors. 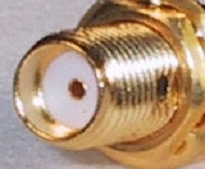 As you can see from the SMA female photo, SMA connectors can be supplied with gold plated threads. This is not always a good thing, because cheap gold plating can flake off of connectors and cause you severe headaches. The best connectors use stainless steel on their outer jackets. What about SSMA connectors? They work up to a higher frequency than SMA because they have a smaller geometry. They are more expensive. And they generally can't handle the normal torque used in loosening and tightening them. We try to NEVER use them!